With root systems that make it drought tolerant, Brachychiton populneus is commonly known as the Kurrajong tree, and it does make a great shade tree. 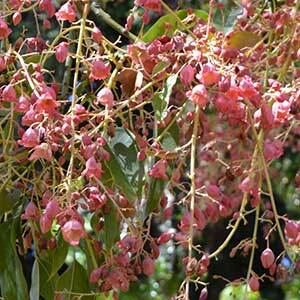 This is a tree from the dry rainforests, it has attractive flowers and a wonderful green canopy that provides the shade much sought after in larger gardens. It is the deep root system that makes this plant such a survivor in dry climates. It is an evergreen tree, although it can drop its foliage during very dry winters as a survival mechanism. They are also more fire resistant than many other Australian native trees. Found widely in New South Wales, Queensland, Victoria and the Northern Territory, they originally grew in dry rainforest areas. Much of the native habitat has been cleared for grazing and agriculture. Flowering from October through to January, Kurrajong trees also act as a host tree for the ‘Tailed Emperor Butterfly’ (Polyura pyrrhus sempronius). Flowers are pin k followed by small fruit. 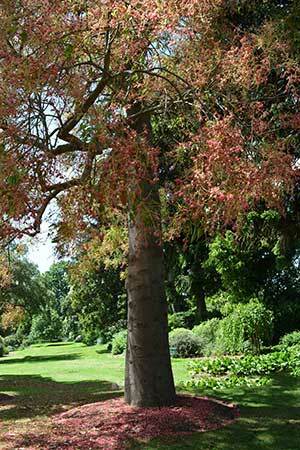 In an open position Brachychiton populneus will reach around 10m – 15m in height with a broad spreading crown. The trunk is someway swollen and the bark is a mid grey in colour. A smaller growing species, Brachychiton bidwillii is known as the ‘Little Kurajong’. Modest size evergreen, broad domed tree of 15 to 20m in height by 10 to 15 m in crown diameter generally with a stout trunk. It is best to look for potted specimens that are no more than 3 metres in height. Taller trees are difficult to transplant without damaging the all important tap root. A deep hole should be prepared that will easily accommodate the root system. The best position is in a well drained soil, and in full sun. This is tree that requires adequate space to spread and although the root system is not regard as invasive, it is best planted well away from drainage lines and buildings. Newly planted trees should be watered through the first summer and through a dry winter if this occurs. After 2 years, little to no supplementary watering will be required. Position – Full sun is best for flowering. Soil – Tolerant of a range of soils, however not waterlogged soils. Height – To around 20 metres sometimes taller. Spread – Will form a crown to around 3 metres. Flowers – Deep musky pink flowers with a bell shape, slightly flared. Frost Tolerant – Light frosts only once established.